The aim of this book is to introduce students to the basic electrical and electronic principles needed by technicians in fields such as electrical engineering, electronics and telecommunications. The emphasis is on the practical aspects of the subject, and the author has followed his usual successful formula, incorporating many worked examples and problems (answers supplied) into the learning process. 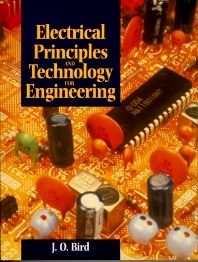 Electrical Principles and Technology for Engineering is John Bird's core text for Further Education courses at BTEC levels N11 and N111 and Advanced GNVQ. It is also designed to provide a comprehensive introduction for students on a variety of City & Guilds courses, and any students or technicians requiring a sound grounding in Electrical Principles and Electrical Power Technology. John Bird, the author of over 100 textbooks on engineering and mathematical subjects, is the former Head of Applied Electronics in the Faculty of Technology at Highbury College, Portsmouth, U.K. More recently, he has combined freelance lecturing at Portsmouth University, with technical writing and Chief Examiner responsibilities for City and Guilds Telecommunication Principles and Mathematics, and examining for the International Baccalaureate Organisation. John Bird is currently a Senior Training Provider at the Royal Naval School of Marine Engineering in the Defence College of Marine and Air Engineering at H.M.S. Sultan, Gosport, Hampshire, U.K. The school, which serves the Royal Navy, is one of Europe’s largest engineering training establishments.